Next week should be an important week. Take a look at the chart of the S&P 500 Index below. 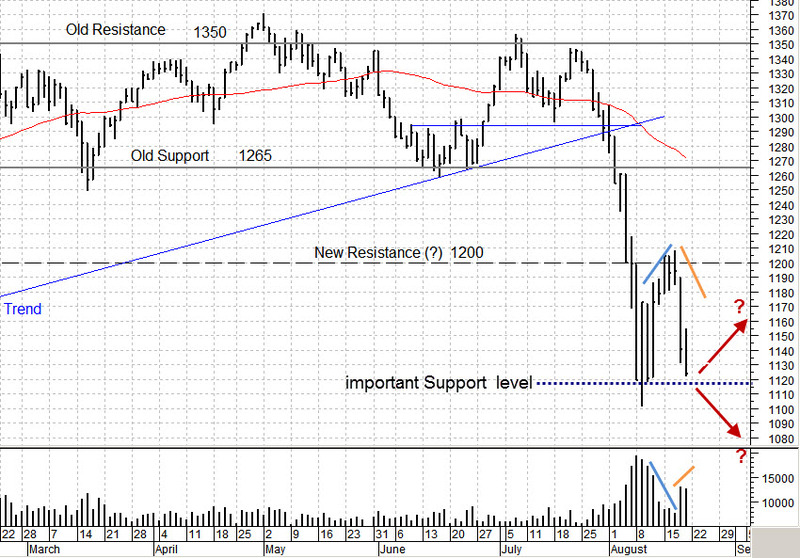 I get an “at-a-boy” for identifying Resistance (dashed black line) at the 1200 level last week. The market went up there and promptly turned around. Not a good sign, but also not unexpected; rarely to markets make a sharp “V” bottom. What’s important is how it got there. The Blue lines show price increasing, but note that the volume was very low; each day it actually decreased. This shows a Lack of Demand. The “smart money” was not rushing in to buy stock, nor was there much selling, so prices went up. Next we note the Orange lines. Prices falling on higher (much higher) volume. Heavy selling coming in, prices drop rapidly. We are right back to the old Support levels. Hummmm. The question is now: was Friday a selling climax, or will the selling continue next week (Red arrows). The close on Friday is at the low of the bar, not a sign of strength. So we need to be patient and wait to see what happens on Monday / Tuesday. We need to see significant buying coming into this market before we can even consider taking a small, measured position. What does “buying” look like? A bounce off support, a wide range Up bar (long bar with a close near the high of the day) on significantly high volume. And, to be cautious, we would wait for confirmation of this bar in the following days. Let’s face it, we’re not going to be very certain untill our old Resistance level (near 1200) is soundly broken. What could mess this up? One signficant news item. If a European bank goes belly up over the weekend, all Hell could break loose. Hence the Red arrows pointing in two different directions; either one could happen. And despite what others may tell you, no one really knows. Not much help, but at least we have a game plan, which is more than 90% of the investors out there have right now. What would be healthy right now is for this market to recover and go into a base building trading range between Support and Resistance levels. IF I HAD to guess, that’s what I’d pick; but I don’t like guessing, “stay in the now”. Take Care, be careful and have a good week.